Bluetooth enabled Smart Tweezers has been updated to include the ability to receive as well as send information from connected devices. Previous models only allowed data to be sent to PC or Apps; now, the device can accept settings using custom profiles. Based on the best-selling Smart Tweezers ST-5S model with extensive menus and high basic accuracy of 0.2%. This model also offers the ability to automatically record measurement data in real time using PC, tablets or smart phones using iOS or Android. The USB receiver stick is required to connect to PC to be used with NI LabView, Windows’ Smart Tweezers Bluetooth Utility and custom made programs. Devices are able to create custom profiles using previous measurements or from scratch. These profiles allow users to set parameters that components must measure between in order to pass or fail. The receiving program will mark the results as red or green when or if they meet the specifications. These profiles can include the type of component, primary or secondary values. Profiles can also send the device custom settings like test modes or frequencies that are automatically sent to the device. Measurement data that is sent can be saved to databases or Excel compatible .csv files. This is essential for tasks where quality control requires all measurement values to be recorded. The USB receiver stick uses an FTDI bridge that creates a virtual RS232 serial port for connection. The new ST5S-BT2 is available in the LCR-Reader Store. 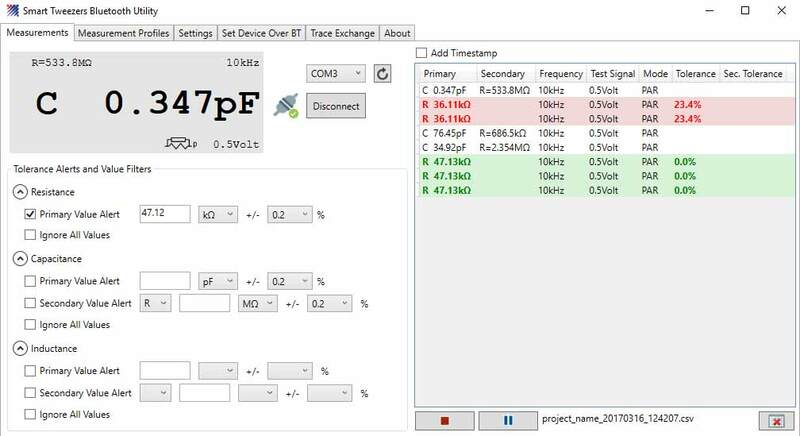 Windows’ Smart Tweezers Bluetooth Utility measuring using a custom profile.